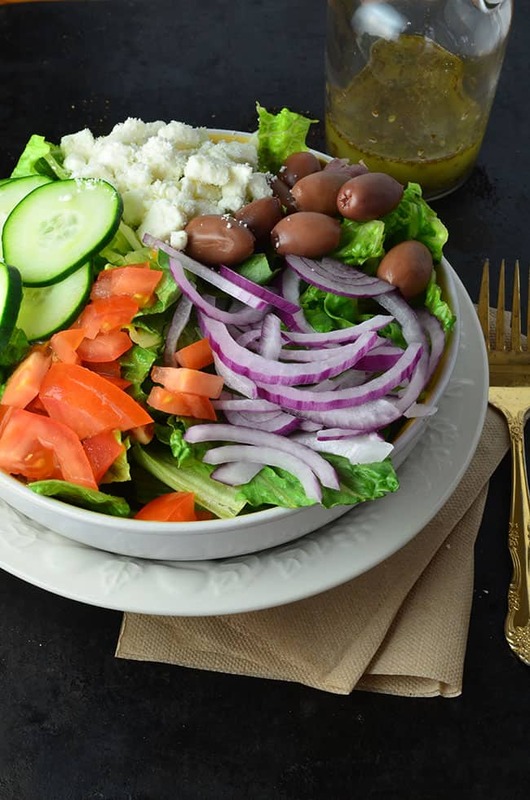 This lovely Greek Chopped Salad is perfect for those who wish to incorporate more healthy options into their diet without sacrificing flavor or quantity. Grill some chicken breast and serve it together with the salad and you have a fantastic filling dinner bursting with intense favor. 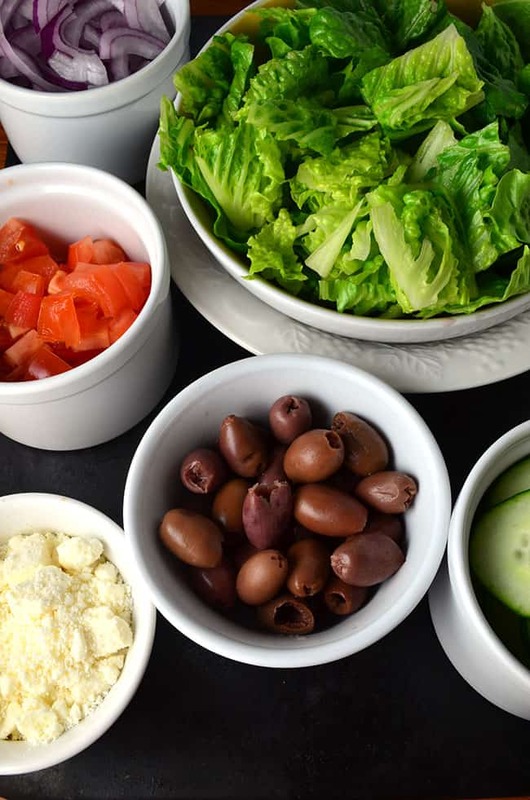 Or skip the chicken and serve a smaller portion of Greek Chopped Salad as an appetizer or side to a great entree. 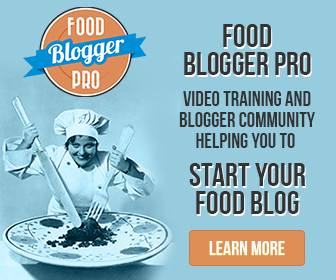 Have you ever tried Kalamata olives? They are a purple olive with a stronger, richer flavor than black olives. They grown primarily around the city of Kalamata in Greece. (Hence the name.) I do love olives, and will eat black olives whole, right out of a can. 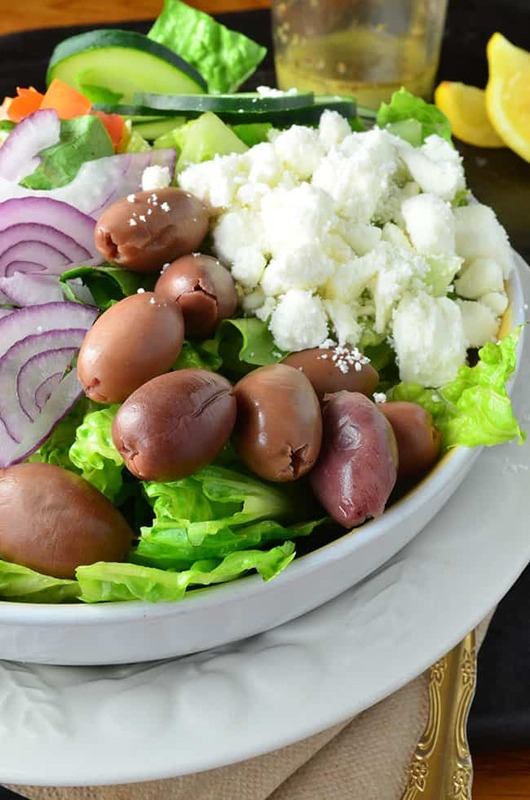 These Greek olives however, are usually kept in a brine or a wine vinegar making their flavor very, very strong. When eating them in this salad I usually will slice them up a bit to spread the flavor around. The dressing used for this salad is equal parts extra virgin olive oil and fresh lemon juice whisked together with some oregano. I am always a fan of fresh herbs, so I recommend using them whenever you can. The oregano really sets this salad apart and brings all the amazing flavors together. There are options at most grocery stores to purchase little containers of fresh herbs, which I think is great! At one point in Idaho I had planted and maintained an herb garden. ‘Sigh’. Oh how I miss my herb garden… but I digress. Becoming familiar with fresh herbs has been one of the highlights for me in my culinary endeavors. I love them! Use them if you can! As I continue blogging about my favorite recipes I am going to try to incorporate more of my favorite ‘healthy’ recipes for y’all to enjoy; sprinkled in with all the really good stuff :0) I hope you enjoy this salad, as always please let me know what you think in the comments! Flavors pop in your mouth when you take your first bite of this beautiful salad. Simple, healthy; it's quick to throw together an sure to please. Combine olive oil, lemon juice and oregano in a large mixing bowl. Whisk vigorously to combine. Place all other ingredients into the mixing bowl and toss to coat. Serves 4 as a side salad or appetizer. Serves two as a main course salad topped with a boneless, skinless grilled chicken breast.